Thematic and Chronological Approach to the Humanities Reality Through the Artsis a popular choice for professors because it provides both a topical and chronological approach to the humanities. Part I, "The Media of the Arts," offers independent chapters on two dimensional art (drawing, painting, printmaking, and photography), sculpture, architecture, music, literature, theatre, cinema, and dance. Part II, "The Styles of the Arts," is a chronological history of the arts of Africa, the Americas, Asia, Europe, and the Middle East, organized by artistic discipline and focusing on styles rather than encyclopedic detail. This edition continues its uniquely flexible organization, allowing readers to cover individual art forms and historical context. In addition, the eighth edition is now available with MySearchLab, an online program that includes an interactive etext, assessment, and help with research and writing. A better teaching and learning experience This program will provide a better teaching and learning experience for you and your students. Here's how: Personalize Learning The new MySearchLab delivers proven results in helping students succeed, provides engaging experiences that personalize learning, and comes from a trusted partner with educational expertise and a deep commitment to helping students and instructors achieve their goals. Improve Critical Thinking Questions about specific issues appear at the end of each chapter, helping students develop their analytical skills. Engage Students Human Reality features and vibrant illustrations throughout the book give students a further understanding of the artistic process. Support Instructors New MySearchLab, Music for HumanitiesCD, Instructor's Manual and Test Bank are available for this text. Note:MySearchLab with eText does not come automatically packaged with this text. To purchase MySearchLab with eText, please visitwww.mysearchlab.comor you can purchase a ValuePack of the text + MySearchLab with eTExt (at no additional cost): ValuePack ISBN 10: 0205861148 / ValuePack ISBN-13: 9780205861149. Dennis J. Sporre is an internationally prominent and award-winning writer, scholar, and artist. He has a bachelor's degree in Speech and Drama with a minor in music from Central Michigan University and a graduate degree in theatre scenic design and technology from the University of Iowa. Until his retirement he was a tenured professor, department head, and dean at various universities across the United States, including Ball State University, University of North Carolina at Wilmington, The Pennsylvania State University, and the University of Arizona. His administrative and teaching experience has encompassed interdisciplinary courses in the humanities and fine arts. He has sung professionally and designed scenery and lighting for more than fifty productions. His writings, including more than a dozen books, numerous journal articles, and poetry, have covered numerous topics including the humanities, theatre history, and design and technology. He has spent decades traveling the world researching and experiencing the arts and cultures about which he writes. had a great class with a great book which called for a great learning experience. 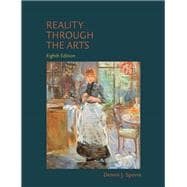 Reality Through the Arts: 4 out of 5 stars based on 1 user reviews.